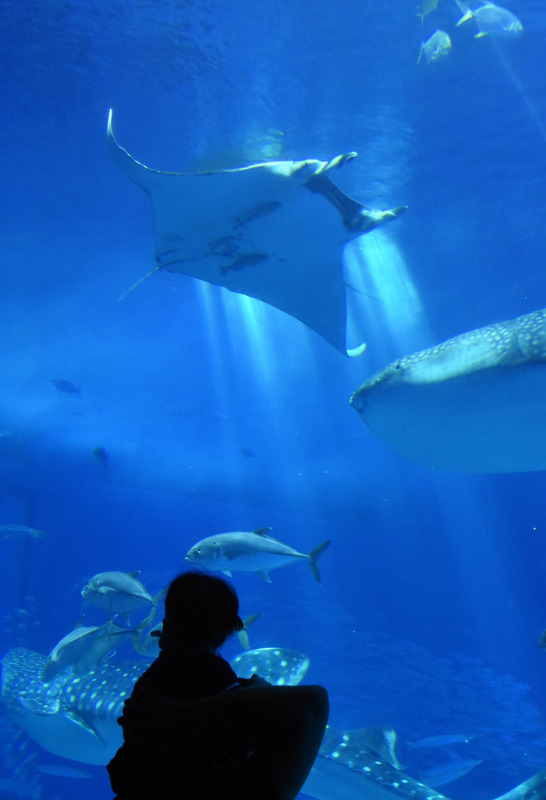 At the Okinawa Churaumi Aquarium, a giant oceanic manta ray can be seen gliding effortlessly through the Kuroshio Sea attraction’s large ocean aquarium, drawing exclamations of delight from onlookers. In a world first, the aquarium in Motobu, Okinawa Prefecture recently announced the creation of a breeding and exhibition program for oniitomakiei — the giant oceanic manta ray — drawing an enthusiastic response from visitors. From Nov. 28, the facility has also been delivering presentations for aquarium visitors that feature its new star attraction. The giant oceanic manta ray is the world’s largest species of ray and measures 4.6 meters across — around a meter wider than the nanyōmanta — reef manta ray — that the aquarium had already been breeding. “You can’t see this in an aquarium anywhere else in the world,” 31-year-old exhibit guide Yukari Baba said proudly after completing the first presentation at 9:30 a.m. The giant manta ray, which was accidentally caught in a stationary net earlier this year, was transported to the facility from a live fish box off the coast of Motobu on Nov. 15, but the aquarium delayed its announcement in order to carefully observe the manta’s health. “This is the day I’ve been waiting for,” Baba said. “I’m so happy to finally be able to tell our visitors” about the ray, she added with a smile. The groundbreaking manta breeding and exhibition program faced a series of obstacles, and the two aquarists at Okinawa Churaumi Aquarium who overcame them were pivotal to the endeavor. For six months from the end of May, 36-year-old Yusaku Kanaya maintained a careful watch over the ray in a live fish box at the surface of the ocean, all the while devising ways to encourage the huge fish to become accustomed to being fed by humans. Meanwhile, 40-year-old Rui Matsumoto, responsible for the large ocean aquarium at the Kuroshio Sea attraction, set about leading the project to transport the manta from the site by boat. The initiative began in earnest on May 29, when the aquarium received a call for assistance from the fishery cooperative in the Okinawa village of Yomitan saying they had found a large manta caught in a stationary net. Matsumoto and colleagues rushed to the village, and confirmed that the catch was indeed a giant oceanic manta ray. Giant manta rays move their fins in a wing-like motion to circulate blood throughout their bodies. If a manta stops moving it will quickly enter a perilous state. The journey from the stationary net in the sea off Yomitan to a live fish box in the sea off the town of Motobu would normally involve lifting the immense fish temporarily onto dry land and transporting it in a truck. But to reduce transit time, the team opted to make the trip entirely by sea. 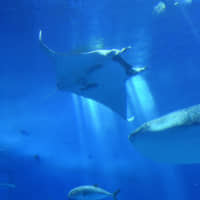 The fact that the aquarium had already made preparations for the possibility of an accidental manta catch soon bore fruit, as the plan could be put into practice straightaway the very next day. The next hurdle would be whether or not the fish could be coaxed to eat. 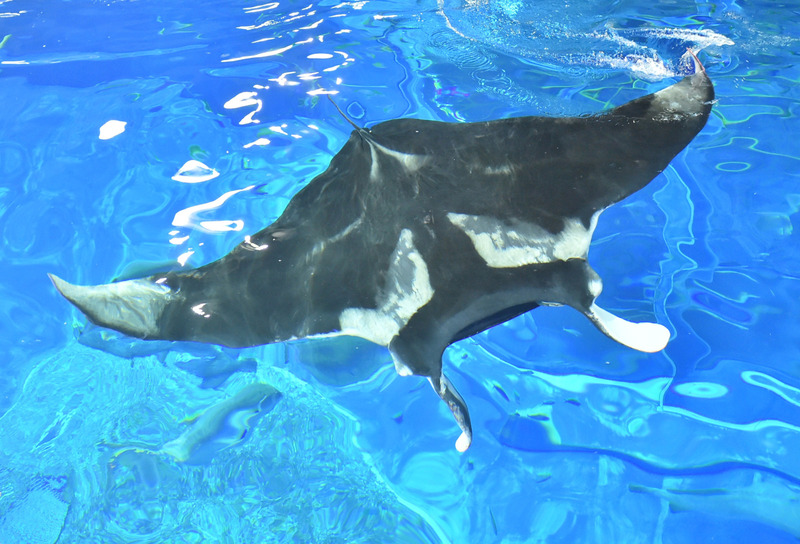 Kanaya, who was responsible for overseeing the live fish box, swam with the manta and tried different methods of scattering food: concentrated in a small area, or spread across a wider one. Through trial and error, he finally succeeded in getting the fish to eat after 13 days. The final challenge was transporting the manta safely to the aquarium. To do so in the summertime, when the water is warm and the ray’s oxygen consumption rises, increases the risks. The team waited until October, but then a typhoon caused a further delay. They finally went ahead with the plan on Nov. 15. To avoid putting the manta through the ordeal of being lifted and lowered by crane into a ship, it was instead transferred to a newly installed, 25-meter-wide live fish box that was then towed by a vessel. Because the custom-made fish tank for use on the truck was too large to be transported during the day, the team waited until after midnight to bring the manta to the aquarium using an oversized trailer. In order to move the manta by sea, the aquarium mobilized a team of around 60 people that included designated researchers from the Okinawa Churashima Foundation. “Through our combined efforts, we were able to transport the fish in a way that was second to none,” said Kamiya, reflecting on their work. “No one knows how to breed giant manta rays,” said Matsumoto, who has a wealth of experience in the field and was the first person to successfully draw blood from a whale shark. Kanaya “worked hard to figure things out,” he added, praising his colleague’s efforts to bring the manta into captivity safely. 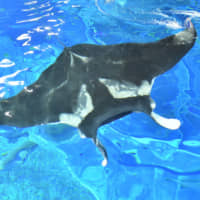 After successfully transporting the manta ray, the pair spent the night in front of the Kuroshio Sea large ocean aquarium. “We were worried about whether or not the manta would be OK, but we were really happy, too,” he said, smiling. “I’d like lots of people to see how big it is, and I’d like them to know that there are amazing creatures living in the sea,” Matsumoto said. “I’d like it to live for a long time,” she added. “I’m so lucky to be able to visit the only such exhibit in the world,” said 32-year-old Yosuke Inagaki from Mie Prefecture joyfully. At the facility’s shop on the day of the launch, manta-themed merchandise, including plush toys and T-shirts, were put on sale. The new arrival is set to be promoted aggressively as the centerpiece of the aquarium’s collection. Until recently it had been thought that the two species of manta ray commonly referred to as “manta” were only one species, known as oniitomakiei. However, in 2009 it was confirmed that there are in fact two separate varieties. At that time, it was decided that the name oniitomakiei would be used to refer only to the larger variety, while the smaller was named nanyōmanta. This section features topics and issues from Okinawa covered by The Okinawa Times, a major daily in the prefecture. The original article was published on Nov. 28.